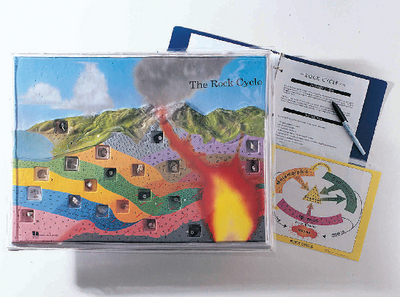 The full-color model diagrams a cross-sectional view of the substructure of a volcano, showing the processes by which rocks change from one type to another. Students can examine 20 actual samples of rocks and minerals, numbered for easy identification: basalt, calcite, coal, conglomerate, feldspar, gneiss, granite, iron ore, lead/zinc ore, limestone, marble, obsidian, pumice, quartz, quartzite, rhyolite, sandstone, schist, shale, slate. It comes with a teacher’s guide. Size: 24"L x 18"W x 2 1/2" H.